I really enjoy cooking and baking. It runs in my family for years. My grandmother was known to bake wedding cakes for every couple nearby. She did it with such an ease, smoothly and by heart. She knew all the recipes and needed no notebook. Luckily, she was wise to write them all down for future chefs to come so my mother and I could still enjoy those vintage perfect combinations of simple ingredients. So happens with panettone. She used to make it at the drop of a hat but somehow I am totally untalented to make it. This is why I buy ready made ones for Christmas and really could not complain about the taste; there are so many different kinds and shapes and fillings that we enjoy ! 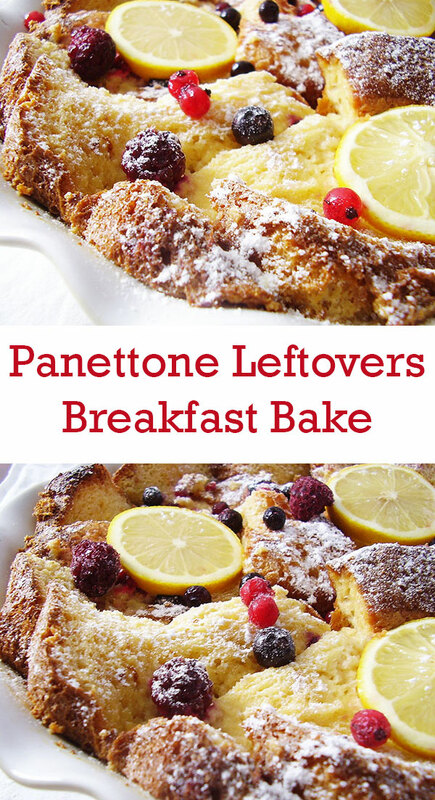 If you have any panettone leftovers or one originally wrapped one in your pantry after holidays , just make this Panettone Leftovers Breakfast Bake. If you do not have forest fruits at hand, use any other fruits (frozen or fresh) ; even jam or Nutella is all right. Just spread it over the slices soaked with dressing and continue with step five. Butter the pan and place 12 slices of panettone into it. Prepare the dressing: slowly melt butter in a small pot and add lemon zest and juice into it. Using pastry brush, spread the mixture over the panettone slices. In medium sized bowl, mix 3 eggs and add icing sugar. Using spatula, combine the eggs mixture with whipping cream and spread over the panettone slices. Leave aside so the slices soak the mixture. 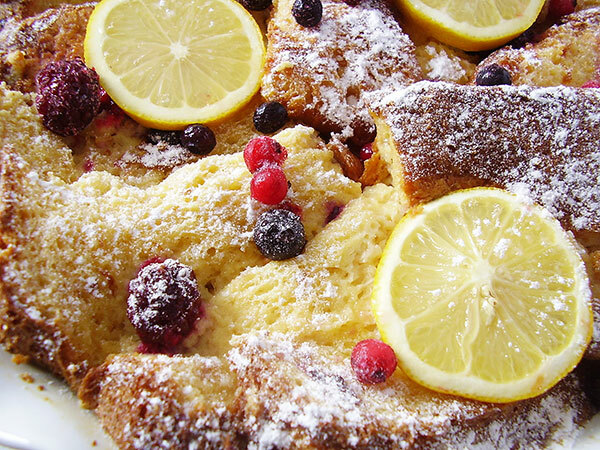 Arrange with 3 slices of lemon and bake for 20 minutes. Leave to cool and garnish with icing sugar and forest fruits to taste. 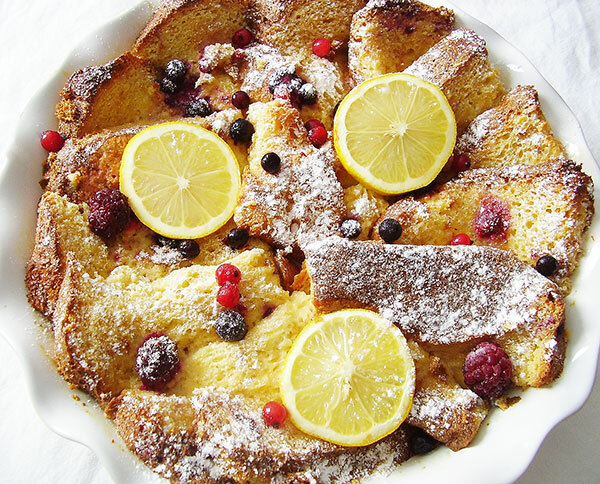 28 Responses to "Panettone Leftovers Breakfast Bake"
What a brilliant use of this delicious leftover. I might just buy a Panettone for this purpose, and not wait for the leftover. 🙂 YUM! This looks so good!! I would love this for breakfast this weekend! Oh yes; we have enjoyed this one after holidays but it is wise to buy panettone for that purpose only; totally agree to Valentina 🙂 Thank you Katherine ! Hello dear Angie ! Thank you so very much ! With Christmas coming soon and the appearance of the customary Panettone gift, this is a good recipe to have. It sounds like a great brunch dish. Thank you Ron ! 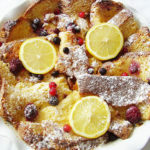 It is a lovely twist to french toast bake because of typical season’s flavours. This looks delicious! A lovely breakfast! Thank you Kelly. Enjoy the week end ! A fabulous way to start the day! And a scrumptious way to enjoy panettone. We love making French roast with panettone – and I know we would love this! Perfect use for all those little leftover pieces! I bought panetonne once just to make something similar! It wasn’t even left over! But I love the drizzle and the berries in yours. Fabulous recipe! So glad you too like this one ….Your posts are so wonderful and inspirational 🙂 Thank you so much ! I’ve never had panettone – can you believe it? But I would buy one just to make this breakfast treat! Hello Jeff; you should definitely give Panettone a chance 🙂 Thank you for commenting ! 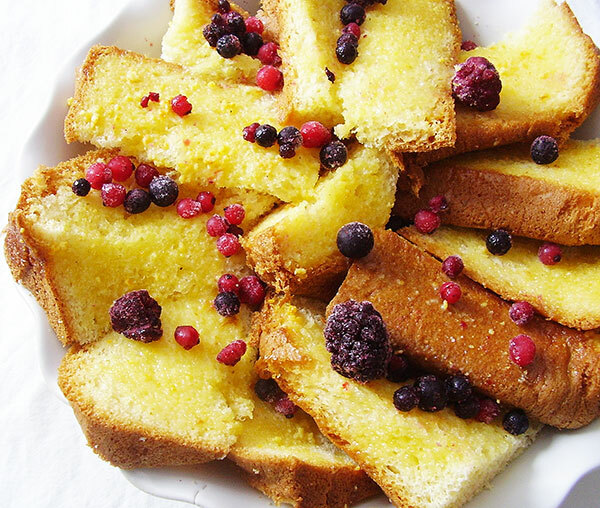 LOVE this idea for leftover panettone! My mouth is watering!!! You would enjoy this one, I am sure. Thank you Kim ! A lovely breakfast and fabulous pictures. What a beautiful breakfast bake! Great idea to use berries. Cheers!